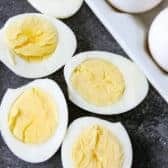 Perfect hard boiled eggs are the base for an amazing snack, appetizer or breakfast! Place eggs in a saucepan and cover with water at least 1/2″ above the eggs. Bring water to a rolling boil over high heat. Cover and remove from heat. Let stand covered for 15-17 minutes (for large eggs). Remove from hot water and place in a bowl of ice water or run under cold water for 5 minutes.